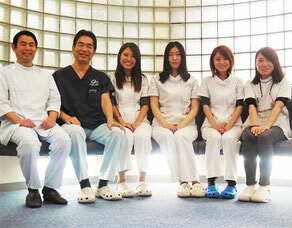 English speaking dentists trained at U.S.C. 1min. from JR Tamatsukuri Stn. 2min. from Subway Tamatsukuri Stn. Established in 1910. My grandfather (the founder) started practice in the U.S. & Mexico, and moved his clinic to Osaka. My father started another clinic in Osaka in 1952. We have been in business for 3 generations. 3-mix (antibiotics) is used .It can decrease the possibility of pulpectomy (removal of tooth nerve). It's also effective for severe root apex disease. General dental practice area (1F), Orthodontic exclusive & dental labo area(2F), study room(3F), attic(4F). Full-time dental technician doesn't keep patients waiting long, as he can make crown & denture fast, easily,and precisely. 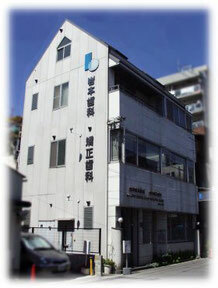 The next building is Iwamoto Medical Clinic and the next is Higashiobase Pharmacy (prescription available). Orthodontic treatment with mini implant........Mini thin implants can be used in our clinic as orthodontic anchorage, they decrease the possibility of tooth extraction and headgear. These implants can be easily removed after treatment.